I've been reading this magazine since it launched in December 2016 and with each issue it has really grown. I bought a years subscription for just $10 and so far it's been a really good investment. Issue 5 is brilliant and features some really great authors. 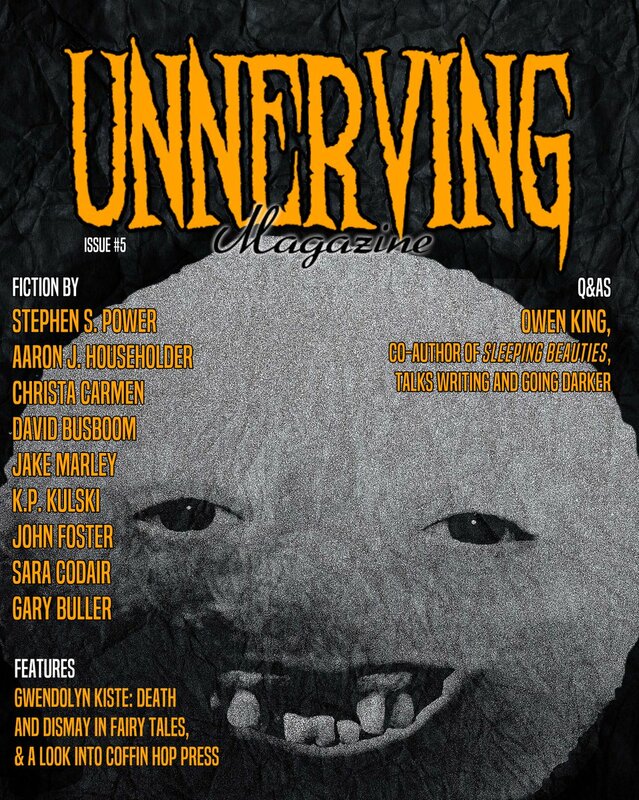 Unnerving's Issue 5 contains nine stories which are all really varied but united with their dark cores of horror. Its also really cool to see lots of female horror writers featured too. Stand out stories for me include, Porcelain Skin, this was just so creepy and I loved how the tension was built up throughout the story and the ending was really cool too! I've been reading his stories for a few years and now and they never fail to disappoint. I also really liked Ghoul by John C Foster and The Weight of Her Smile by Jake Marlow. 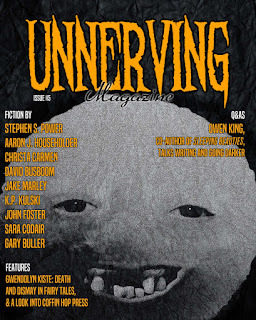 A great tale to start off the magazine, its playful and creepy and leaves you wondering and worrying about what's lurking in your house. A young woman wakes up with gruesome photos on her phone after her friends messy alcohol fuelled wedding. No one can explain or take her concerns seriously and yet they keep coming.I loved this story, thought it was a really dark and unsettling premise and teaches mankind how you're girlfriend always knows best! A young woman travels to the middle of nowhere to visit her long lst wealthy Aunt after hearing she is set to inherit from her. This tale was really creepy and full of suspense I was actually scared on a few occasions! A young boy fuelled by adolescent urgings and curisoity breaks into a graveyard to find his ultimate prize. This tale was so dark and twisted and held me enthralled from beginning to end. John C Foster is a name I'm going to look out for. A young woman has to battle between what's right and her desires. This was a cool little tale abiut why you shouldn't follow a lady into the toilets! Sharon really regrets asking her boyfriend the worst thing he's ever done. A story that stays with you long after you finish reading. Is it still out there? Left alone by his wife to care for their young child, a young father realises there's something very wrong. This is a really clever retelling of a well known faerie creature who strikes with devastating consequences. Lari Daniels has 1,834 seconds to get to the Mare and back before her oxygen runs out. What could possibly go wrong? A really nail biting and tense tale. A young man wrestles with his demons before he can move on. I really liked this tale, it was really thought provoking and emotionally moving. This is a writer I'd like to see lots of in the future.